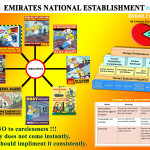 Emirates National Construction and Project Management which is known as Emirates National Establishment or ENE is a UAE owned ISO certified Company formed in 1985 with its headquarters in Abu Dhabi, the capital of the United Arab Emirates. The Company comprises numerous Business ownership interests, joint ventures. ENE comprises of various Divisions such as Real estate Division, Stevedoring Division, Engineering Division, Telecom Division, IT Services Division and General Trading Division. Over the Company’s “3 Decades” history, ENE has grown and expanded to become a multi-national, multi-discipline and a recognized leader in the thriving and expanding markets of the United Arab Emirates. ENE has an experienced and highly skilled multinational staff with offices in Abu Dhabi and Dubai to provide all the expertise and services necessary to be successful in the complex market place of the Arabian Gulf.ENE is one of the leading stevedores contractors currently operating at Abu Dhabi Ports Company (ADPC) managed Ports – Mina Zayed, Mussaffah Port and Khalifa Port. Since 1997 ENE has been handling all kinds of Cargo, Heavy Lift, RO/RO, Bulk, as well as all kind of Containers discharging loading, Stripping, Stuffing, Lashing, Loading, Unloading and Delivery. ENE has had the privilege to witness the spectacular evolution of Abu Dhabi Martitime & Shipping industry. ENE has also executed Stevedoring Tasks at Mina Zayed, Mussaffah Port, and Freeport under Abu Dhabi Seaport authority & Abu Dhabi Terminals. ENE’s Trading Division is mainly dealing with Oil Field Companies and Government Departments for various equipments and solutions. Some of our clients are ADNOC, ADGAS, ZADCO, ADCO, TAKREER, ADMA, GIC, Etisalat, MOI, WED, UAE Defense etc.